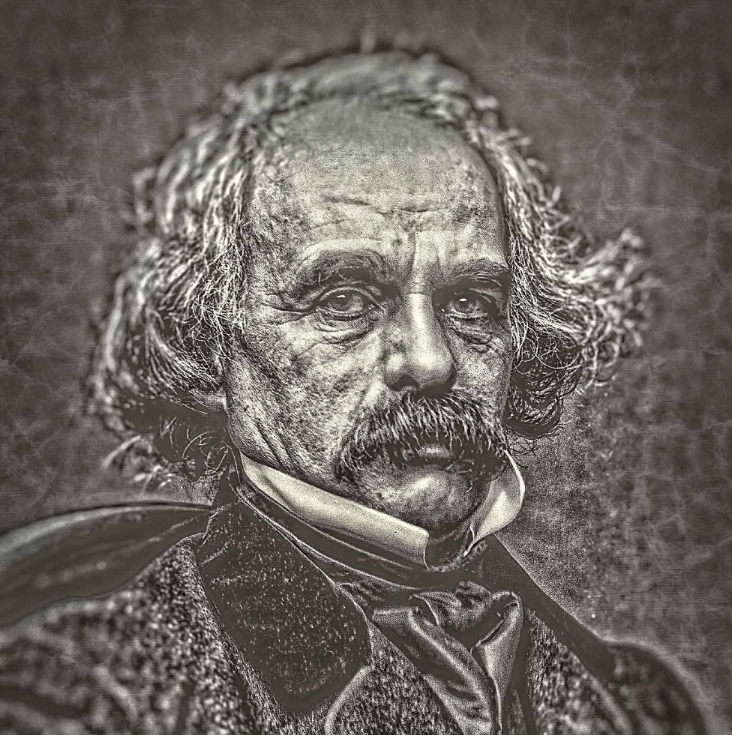 Sad Nathaniel Hawthorne. Daniel French, 1925. Plaster painted to simulate weathered bronze. New York Historical Society. Some of the books are very old, and appear to have been composed during the earliest days of colonization by the residents of this area. Others are older still, and appear to have originated in England and been brought by the colonists. These are predominantly about ancient religions and burial rites - William’s field of expertise. There are also several diaries that appear to have been composed in the seventeenth and eighteenth-centuries. Then there are William’s own journals, which record his interpretations of these books and his own experiences in the House since discovering them. To my delight, though, I have found an even greater discovery. For along the musty bookshelves I have found a series of heretofore unknown volumes related to, and some even composed by, the American author Nathaniel Hawthorne. Photographic portrait of Nathaniel Hawthorne, 1860-1864, by Mathew Brady. 1 negative : glass, wet collodion. Creeped up by Donald Stull. I stumbled on them as I sorted through the books and manuscripts stacked along the basement’s rotting shelves, and strewn about the damp floor. It’s incredible. These volumes relate a history of this very house, from its erection in 1692 until its renovations in the nineteenth century. William does not appear to be very interested in these papers; his journals do not even mention these manuscripts. I recognized Hawthorne’s elongated, slanted handwriting almost immediately. The more I inspect these documents, the more I am convinced of their authenticity. I am somewhat qualified to make this judgement. By coincidence, I had done archival work on Hawthorne during my days as a graduate student, and even published several articles about the author. Reader, you will scarcely believe what I am about to tell you! These manuscripts, which I have dubbed “Hawthorne’s Barrow Notebooks,” cast a new and mind-bending light on the American author, as well as the early settlement of New England. They chronicle Hawthorne’s intermittent visits to what the author describes as “the House of Seven Gables,” as well as histories and legends that Hawthorne learned of the house from its residents. They also contain Hawthorne’s reflections on some of the other sets of manuscripts and letters that I have found along the basement walls. These seem to include diaries kept by members of an actual Pyncheon family that built an original house on this property in 1692, and inhabited it into the nineteenth century. Yes, that Pyncheon Family! Brace yourself, reader, for The Barrow Notebooks indicate that Nathaniel Hawthorne acted as a participant in some of the tales he characterized as fiction - including his novel The House of the Seven Gables. Indeed, the notebooks indicate that the events of the novel were not fictional at all, but occurred here in this very seven-gabled home from which my dear friend disappeared. Hawthorne told only a fraction of the true story of the House in his novel. He must have deemed the actual events too horrible and shocking to relate to his readers. In some ways these volumes bring into doubt our very understanding of reality. In other ways, they corroborate some of the more eldritch revelations contained in dear William’s journals. I tremble as I type these words. For these journals radically alter our conceptions of the original mission of some of New England’s leading colonists! Because of this, in addition to transcribing William’s journals I have begun writing a series of interlocking stories and novels that relate the Mysterious and Weird, yet absolutely True events fictionalized in Nathaniel Hawthorne's now-classic The House of the Seven Gables. I will update this site with some of the true stories which inspired Hawthorne’s own writings as I am able to further authenticate and transcribe them here. I am excited for the truth about Hawthorne to be known, and certain of the importance of my findings for the field of American literature. But for now I am reluctant to say more about my shocking discoveries.